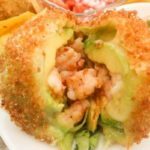 Chilapitas Mixtos | Mexican Appetizers and More! Chilapitas are a lot like Sopes. Remember those?? How delicious are those?! 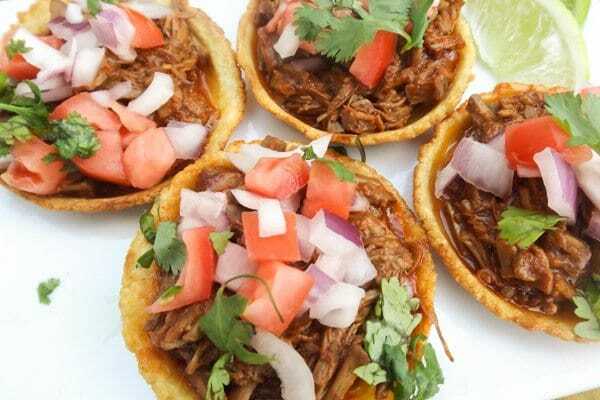 Well these are a smaller scale version of the famous Sopes. Less packing but just as delicious! 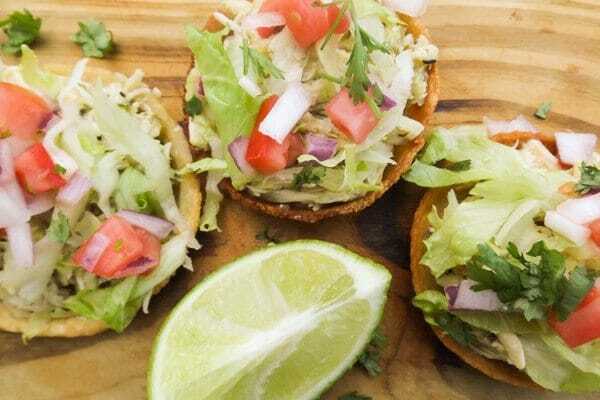 In case you unimaginably forgot about those or haven’t had the opportunity to make my Chicken Sopes, let me explain a little. 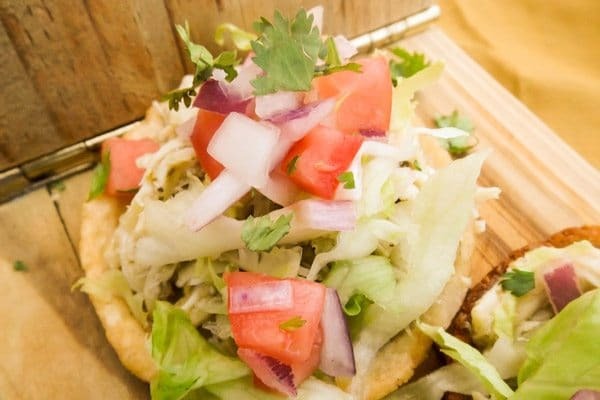 Sopes are like a three to four-inch corn flour or masa basket filled with refried beans, chicken, beef, seafood, pork or whatever yummy concoction of meat you like, topped with lettuce, avocado, queso fresco, cilantro and a red or green hot sauce. Absolutely delish! But if you are going to make these as an appetizer, you would probably make one or two per person, NOT more because they are deceptively filling! Okay so back to Chilapitas. 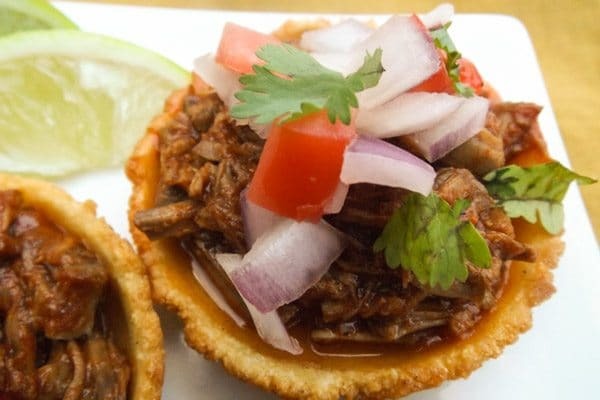 Chilapitas are very similar in that the masa is made with the same ingredients as Sopes but Chilapitas are much smaller. They are about two inches around and don’t have or need the same toppings. Hence they are less filling and require less toppings but do require a tasty meat or seafood balance. Remember this is a small shell with A LOT of flavor! I have decided to make Chilapitas Mixtos or Mixed Chilapitas. I wanted to give you some diversity! Make all three as a sampler appetizer or make just one! I chose, Chilapitas de Ceviche (Ceviche Chilapitas), Chilapitas de Res (Beef Chilapitas) and Chilapitas de Pollo (Chicken Chilapitas). 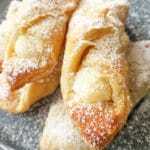 If you do decide to make all three, it may be a little time intensive but well worth it! 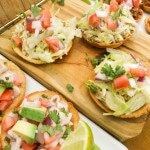 But what’s great, just like sopes, you can make everything in advance! 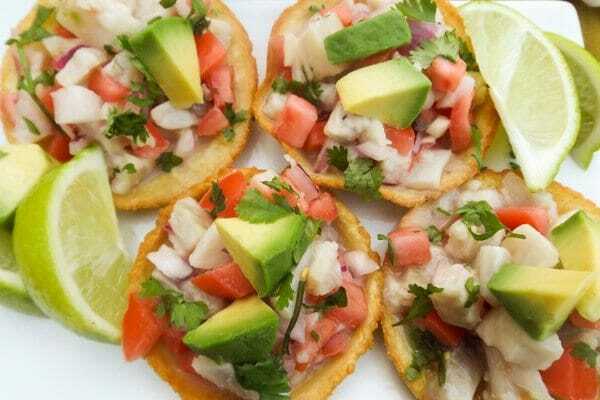 You can also make the chilapita masa shells and freeze them, just use them when you have leftover meat or seafood and make a quick snack or appetizer! 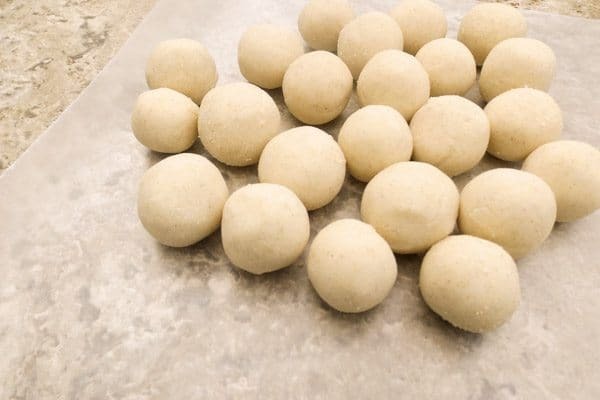 After making your masa (corn flour dough) form into 1 1/2 inch balls. 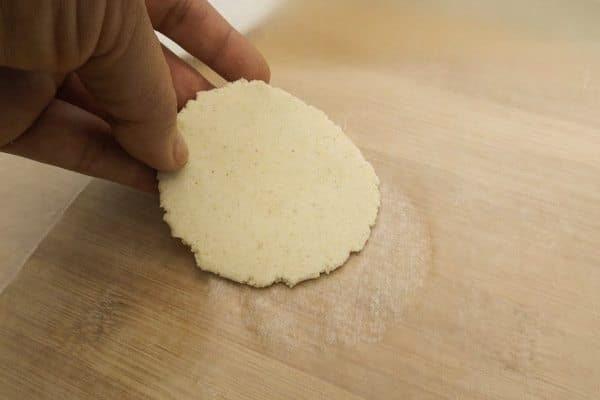 If you do not have a tortilla press just use a plate. 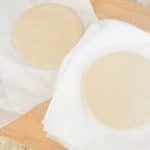 Place dough ball in between two sheets of wax paper and press down with a plate to form round disk. Disk should be about 2 inches around. Preheat oven to 375 degrees. 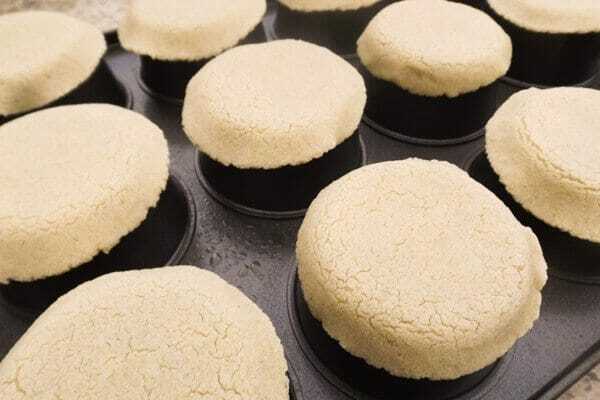 Place on top of muffin tin to form scoops cook to harden a little for 5 to 7 minutes. Can also skip this step and just fry flat chilapita shells. If you do place them in the oven to harden a little, the shells will look like this before frying. Then fry in a pan with a little bit of oil until golden brown. 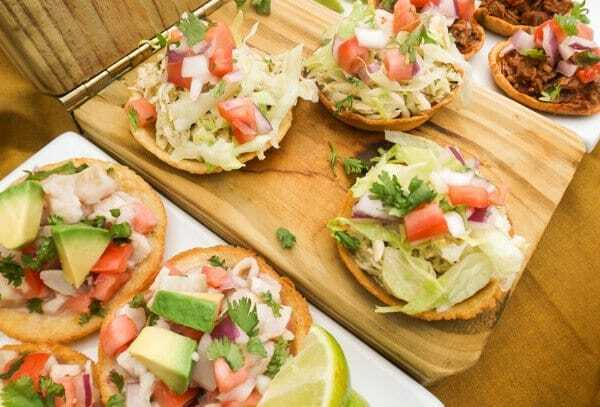 now scoop prepared chicken, beef and ceviche to shells. Top beef with tomatoes and red onion. Sprinkle with cilantro if desired. Top with lettuce, tomatoes and red onion. Top with extra green sauce if desired. Sprinkle with cilantro if desired. LOVE, LOVE, LOVE CHILAPITAS MIXTOS!! In a bowl mix 2 cups of Maseca corn flour with the water and salt. Form into a dough until all dough is off the sides of bowl (may need to add a little more water or a little more corn flour). Form into 1 1/2 inch balls. You should yield about 35 balls. On a flat surface place a sheet of wax paper. Place a ball on top of wax paper. 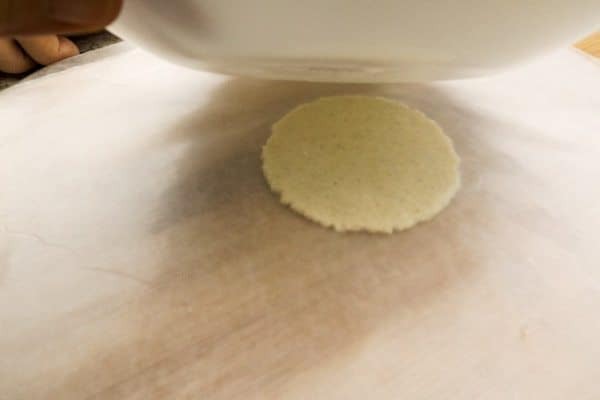 Add another sheet of wax paper on top of ball and press down gently with a plate to form a circular 1/8 inch flat disk. Repeat steps with other corn flour balls. 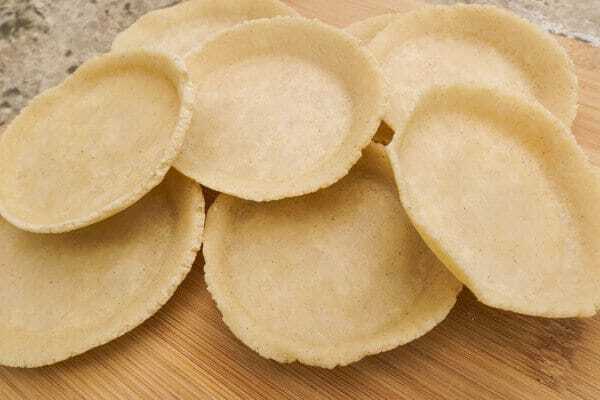 Place muffin tin in oven with chilapita shells for 5 minutes to harden. In a skillet add a 1/4 cup of vegetable oil and heat over medium heat. Fry disks until golden brown. Drain on paper towels. Set aside. In a pot over medium heat add enough water to cover beef. Add quartered onion, garlic cloves and bay leaf. Cook for about 2 hours until beef is fork tender. Remove beef and shred beef. Set aside. Add your guajillo peppers, ancho chile peppers, arbol peppers, onion, and garlic to a saucepan with plenty of water to cover and cook over medium heat for about 20 minutes or until the peppers soften up. Remove peppers from pot. Under running water, remove all seeds from peppers. Remove stems. Add all peppers, onion, garlic and reserved broth to a blender and blend until smooth. Strain sauce through a strainer to remove extra seeds and skin. You will now have a sauce. Add sauce to shredded beef and mix together. Season with salt to taste. Cut tilapia into small cubes and set aside in a plastic bowl. Cut all limes. Squeeze and juice all limes over tilapia, stir together and refrigerate. While tilapia is marinating (cooking in the acidity from the limes) cut the tomatoes, red onion, jalapeño, cilantro and garlic. Add and mix all to tilapia with salt to taste. Refrigerate again for another hour until tilapia is cooked and flavors are well blended. Rinse chicken breast and remove skins. 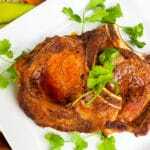 Place chicken in a saucepan with enough water and salt to taste. Cook for 20 minutes. Remove chicken and let cool for a few minutes. Reserve a 1/4 cup of broth chicken was cooked in. Shred chicken with two forks or cut into very small cubes. Set aside. Remove stems from serrano peppers (remove seeds and membrane too if you don't want it too spicy) and peel garlic cloves. Note: Could also use half of one serrano for the sauce to start with and if you realize you want more heat continue adding more serrano until you find your heat level. Add about 3 cups of water to a saucepan. Heat over medium heat and gently add tomatillos, garlic, onion and serrano peppers. Cook for 15 to 20 minutes until tomatillos are soft. Transfer all to a blender with a 1/3 cup of cilantro and the 1/4 cup of water. Blend well together and season with salt and pepper to taste. Add about half of the green sauce to the shredded chicken breast. If chicken seems to dry, add a little bit of the reserved chicken broth. Note: Reserve some sauce for topping for Chicken Chilapitas. Set aside. Cut and shred the lettuce. Chop the tomatoes and red onion. Cut avocado into cubes and sprinkle with lime to prevent avocado turning brown. Now we are ready to prepare the chilapitas. Warm up chicken and beef in the microwave for a minute or two. 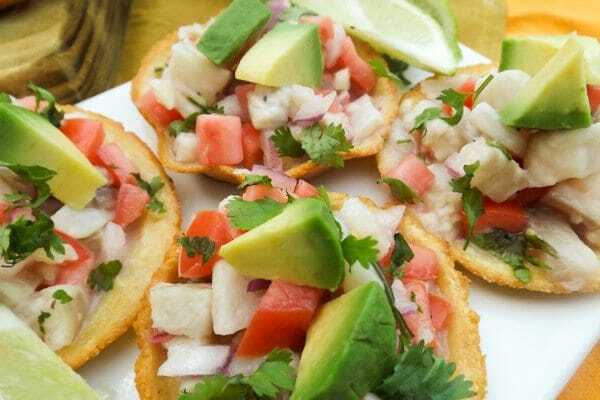 Remove tilapia ceviche from refrigerator. Scoop mixtures onto shells. Top with lettuce mixture and avocado cubes. Sprinkle with cilantro if you like. Enjoy! 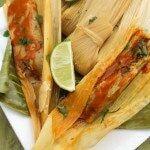 So which Chilapita will you be making this weekend? Can’t wait to try these! They look delicious! Thanks for sharing. Thank you Lori! These are fabulous! You could try all three or just one! They are all delicious! Thank you again!